Well, to me, it’s simple. You are hoping that the insurance company has better financial analysts than you, the customers. Other than that, ANY insurance endowment plan,*WILL* logically be worse than you yourself going out and buying that same basket of bonds, since the insurance company takes a sizeable cut of the profits. I believe that insurance companies have made more than these returns. (If not, the fund managers will be fired sooner or later). However, they are not sharing these returns/profits with the “rightful” (aka policyholders who are also the owners of the capital/money) parties – after all, they have to pay themselves first, their managers, their debtors, their shareholders, then …policyholders will probably be the last. Hence, they are very clear when you buy a policy, they usually tell u “PROJECTED” returns. I wonder how many policies have paid the policyholders beyond projected or rather beyond inflation ! I know of fund managers who took the easy way out, just buying the same tenor as the policyholders’ requirements for their liquidity and gapping purposes. It is a no-brainer job. Sometimes, their company’s policies do not allow them to take unnecessary (basis) risk, Sometimes, they themselves have no appetite for risk (as they may lose their jobs if they took such risk and their views are wrong). Sometimes, they just took the easy way out. Plain lazy. After all, they are paid regardless if they make you that extra cent or not. My take is that … if you know how to invest your own money effectively and efficiently, it is best to do it ourselves, especially for endowments. I understand that there are some retail bonds listed in SGX that may give you same type of return (as these endowment policies) with only SGD10k investment. I have a 21 years endowment policy with AIA maturing in 2 years. What irks me is the drop in the forecasted maturity by about 8% just before the maturity. During the GFC, the value was understandably reduced but cannot understand how they can drop it now. And interestingly AIA has been touting good results! Apparently the AIA CEO forgot who are paying their salaries. There is no reply from my agent on this drop a few months back despite her 20 years of service but very efficient in providing quotes. What to do, just bear with it and pray they don’t monkey with this another year down the road. Hi Winston thanks for sharing. They have a bias to make sales so we all have to understand that. Annual about $3.6K for 21 yrs. $5K Cash back every 3 yrs (total $30K over 6 cashbacks). Current to date value is around $29K with 2 more yrs to go, the projected value (guaranteed + non guaranteed) is a better gauge to compute the final returns especially when policy is nearer to maturity. (it is unattractive to customer if endowment is only sold on guaranteed value alone). Btw, I hv no issue with insurance agent being bias towards sales. Providing a good service with a great product can only bring them more sales but definitely not by avoiding customer’s concerns. Hv a great day! I have worked in various insurance companies for many years. Participating products (those with bonuses declared) would typically have about 5% projected returns for longer term products (for eg whole life) which is presented as partly guaranteed and partly non-guaranteed. Hence, there is room for lower returns should the pooled investments fail to meet the target, which is assessed on a yearly basis by the Appointed Actuary. Customers should look into the Company’s past track record and the fund’s asset allocation strategy to determine whether the returns seem achievable. For endowment products, the returns will be lower especially for shorter duration terms for eg 5 or 7 years. All you are comparing is in fact against Fixed Deposit returns, as the insurance company typically buys bonds to support the required yield. At the end of the day, buy insurance for what it is – to provide cover for a rainy day and stick with it long term. Or simply buy term. By the end of the year, insurers will be forced to provide customers with an online term option so customer can choose wisely. hi victoria, thanks for explaining. i have no doubt that most who get endowments are looking at it for another purpose. that is, to save. The usual 5.25% and 3.75% (in the past, now 4.75% and 3.25%), PIROR (Projected Investment Rate of Return) on the Benefit Illustration refers to the Insurer’s par-funds rate of return NOT the Investor’s rate of return. 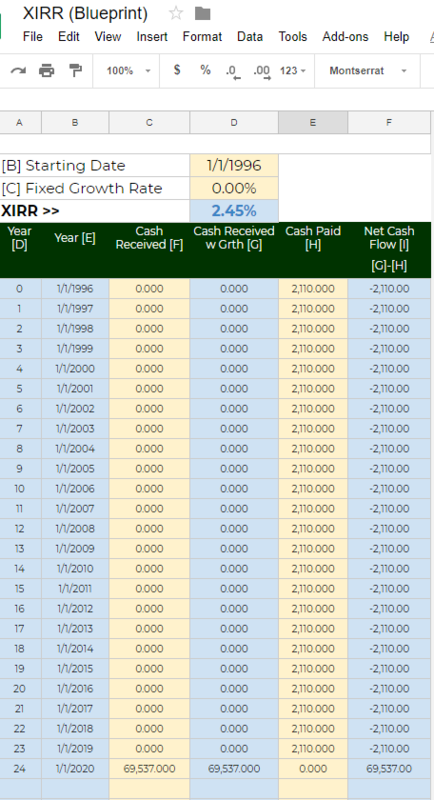 Thus the XIRR method is the right way to calculate the actual Investor’s return. This is something many insurance agents fail to grasp. Or worse mis-selling. Returns of endowment and whole life policies (participating) are based on contractual values: (1) $1 per $1,000 sum insured PLUS (2) compounding bonus (CRB) of 1% PLUS (3) loyalty bonuses at certain intervals PLUS (4) maturity bonus. For the $1 per thousand sum insured and CRB, the contract value can be reduced subject to par-fund performance by the insurer. Example: $0.70 per $1,000 and 0.75% CRB, when times are bad. Prudent insurers practice “smoothing”, so that they can maintain the payout. In extreme cases, insurers can also change the loyalty and maturity bonus (these bonuses account for a large portion of the total payout). Some insurers have cut these before, resulting in a VERY poor return for investors. Only Tokio Marine Asia claims to have NEVER cut bonuses. 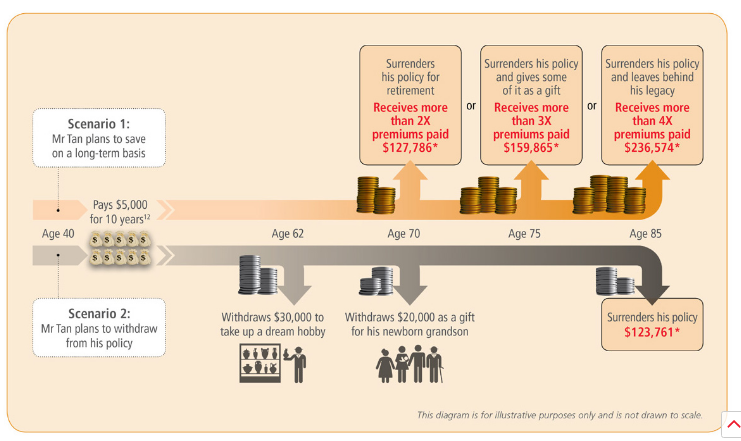 NTUC is known to have high returns FOR older policies (not the newer ones). This is where the NON-GUARANTEED portion of the policy is derived. In general, even without any cuts, returns is typically 2-3% for “cash-back” policies, 4-5% for long term (25-30 year) “no-cash-back” policies, and very low 1-2% for single premium 3-8 year policies. For these and above reasons, if one’s estimation of accumulation goals require them to achieve 5-6%pa returns to reach their goals, endowments definitely cannot work. However, if one’s needs are only 2-4% and are very risk adverse, have no time for stock investing, nor the interest to learn more about it, may eventually still be better off doing something rather than nothing. Alternatives to endowments can also be considered (with decent capital protection): buy corporate/government SGD bonds (when yields are good), bonds offered by cooperatives (NTUC, AUPE), volunteer top-up to CPF, buy preference shares, etc. In my opinion and as far as my practice is concerned, usually endowments are a bad idea. thanks for clarifying Brandon. The problem is that folks like us have no accessed to 4-5% bonds due to the lot size. i think its misleading if the projected return is not going to be the final returns the assured will enjoy. Cannot buy bonds can buy preference shares also… actually there are the LTA, HDB bonds tradable on SGX for small lots. I agree that the projected returns thing is misleading. Many agents are also ignorant of the difference. There is a recent regulation that requires insurers to declare the actual yield of the policy. Just that it’s not easy to find. So where will this actual yield be shown? In all policies nowadays, it is a requirement to show the effective yield (thank goodness, not many investors know how to calculate XIRR). It can be found usually in the section explaining policy Yield, and Projected Investment Rate of Return (PIROR). Look for that section. ah thanks for educating our readers. Hi Kyith, great job you are doing! I am recently disturbed by the returns of some of the maturing polices of my parents’, and will be sending you some data after I have confirmed them. We have to take note to deduct any premiums paid for riders though, if any, as they don’t accumulate to the cash value. From one of my IFA friends, he did mention TM Asia has the highest returns among companies. Hopefully this can be verified by your effort. Thank you so much for your help. A lot have mentioned the good performance of TM. To be fair i am still wondering why. Many have said the returns are due to some very early investments and compounding. Nevertheless i hope that i can have some really good data. Hope you have friends who could share theirs as well . Hi Kyith, really enjoy reading your blog! Allow me to side track a bit, I had a WholeLife policy not endowement policy, I just surrender the policy after 20years, ( I find the policy not cost effective), the Projected sum on year 20th is $23,426 but the actual payout I receive was much lower @ $17626. Hi Connie, I appreciate it a lot you are sharing with me. Is this a full whole life that you pay forever. I think perhaps they need like 30 to 40 years for u to see the real return Raye. Another thing policy holders can do to get a better idea of what their policy will be worth sometime in the future is to ask for a updated benefit illustration. Which means that the insurer will recalculate based on current assumptions and bonuses already paid out, and re-estimate the projection. One client we had was shocked to see a difference of $250,000 from his supposedly $1m projected payout from HXXC insurance. I mentioned in the response to victoria, that returns come from (1) contractual $ per thousand sum insured + (2) compound or simple bonus + (3) periodic bonus likely in the 15th, 20th, 25th, 30th years + (4) maturity bonus. So why Connie is getting less than projected is because: (1) has been cut over the years as the par-fund investment delivers lower returns, largely dependent on bond yields which is lower due to interest rates, Singapore par-funds have a mandate to remain at least 60% invested in bonds (2) potentially the periodic bonus may have been cut as well. … if you do investment without any clue thats gamlbing. or take the conservative route put their money in banks time deposit which gives them around 1+% currently for 1 or 2 yrs lock in. you all talk like you know everything lmfao. but oh wait…oh wait wait wait, did Ma Yun who is filthy richer than all your broke asses put together say insurance is what everyone should get? I am trying to understand what u are trying to say but I just do not get it. At the end of the day, the big part of the costs go to advertising and the commissions for insurance agents. For a regular premium endowment plan, the agent could be getting 30%-50% of the first year premiums paid, and less in the 2nd year. This is a huge cost for the company. Since the commissions paid out to the agents are already lost, the company then has to spend the next two decades painstakingly adding back to the cash value of the policy. It is great that MAS is starting to embark on educating the public to buy their own term insurance online as well as introduce the SSB in Q3 this year. Both the end user and the company will enjoy significant cost reductions once commissions are taken away or greatly reduced. Moreover, the guaranteed cash value for any endowment plan is always less than premiums paid. They can engineer the product in creative ways, but it still doesnt hide the fact that capital is almost never guaranteed, which leaves you at the mercy of reversionary bonuses etc. To me, if you are looking for a safe haven for your money, this does not seem to be a good deal at all. Hi Justin, i don’t dispute any of you said. they are all spot on. especially the less than projected. but i would say that from what i see, the historical yield is still less than the current SGS bond rates. The saving grace is that in the future, it may look very different, so if you can lock in to some SGS bonds at a good yield its great. I fully support the SSB, and SGS bonds. Low cost/no cost long term investing produces far more good for society as a whole. I am real sick of seeing people around me have their insurance endowment plans mature after two decades and realise they get a CAGR of less than a fixed deposit, or worst, make a net loss on total premiums paid. The insurance industry is structured in such a way where with enough disclaimers and exclusion clauses, you can stab someone in the chest and profit from it. I find your exercises above useful for whoever visits your blog and wants to find out about endowment plans. However, to sidetrack abit from mathematical calculations, the concept of the type of endowment plans the mass market buys does not sit well with me. This is because the returns from endowment plans are so small in real terms. At maturity, the real returns are small for endowments up to 100k, probably less than 2k ish (100k lump sum) per year if you are lucky, and that is after holding it for decades. So what happens during the sale of the plan is capital is taken from the customer by the company, then half of it is used to feed its staff and your agent and send him/her on trips when they hit sales targets. At the end, capital is lost and paid out and the customer bears the brunt of it in the form of a lock in period which spans decades, or risk getting back significantly less capital should they need to use the funds on short notice. I know at the end of the day the agents will say that you get a portion guaranteed plus some projection blah blah if you hold it till maturity. However what i think people should be more concerned about is where did his money go? This trade off in the form of an extensive lock in period does not seem like a fair exchange for the level of return that we are seeing. There is alot to think about when it comes to what is the real significance of these endowment plan returns before even looking at CAGR etc. Is a return of a couple of thousand bucks at the end of two decades good enough a reason for it to be locked up for so long? Then again this is a very rough sketch of points, but i always believe that in investing, if the investment seeks you in the form of an agent, or a catchy advert, you will always stand to lose when compared to you seeking the investment by doing your own homework and uncovering what really is beneath. Now i sound like the insurance agent defender haha. I think i look at it this way. You bring up the returns are small when it comes to real returns. I would say lets establish this baseline. Most are risk adverse and do not have a good idea how to work with volatility in their wealth building plan. If you agree on me on that, the amount of available easy to understand instruments are constraint. I took some time to find an instrument to help readers and friends to AT LEAST take action first. I came up with 2: Endowments and STI ETF. Why? No one have heard of how preference shares, SGS bond how they work, so this SSB is a good thing in that 1. at least i know its fundamentally sound, 2. they have heard of. But if you look across the board almost all of them provide poor real returns! even SSB if we are to back date. I guess your gripe is the unknown cost in the black box. i am philosphical in that, i am an advocate that a large part of your returns is controlling or being very harsh in minimizing cost since cost compounds. But when we look at the IRR of something that projects 5% but gives 3.5% after cost its not too bad. If you ask kyith is this good enough for him. NO. Kyith knows this black box and he is very uneasy about this. But some poison are a necessary evil. I really thank you for your point of view. it shifts my idea on these subjects. Hi Justin, for your info, there ARE endowment plans that provide 100% guaranteed cash value on your premiums paid (AKA Capital Guaranteed), Plus the non-guaranteed bonuses that we were all discussing.. If you are interested to park your money, I’ll be happy to be of service to you. Hi Nicholas, your cash back is at which year of the interval. Do you have the start date of the policies and the name of the policies? Can you explain to me how do you get the interest of 3.25% and 2.2% respectively? thanks Nicholas, would it be ok that i highlight this 2 policy anonymously together with another policy my friend highlighted to me in an upcoming post. i will show the calculations there. hi Nicholas, i posted it in my most recent post. thanks a lot man. I have a great eastern insurance friend who is curious about the original projection of the policy, did you managed to have that haha! I know its difficult! Sorry, where do I find your most recent post ? The calculation is too complex for me to understand such as XIRR & CAGR ? is there any difference between the two ? I don’t see any XIRR or CAGR of 3.84% in the chart, how do you get it ? Is it possible to email a soft copy of the calcalation for my future reference ? Hi Nicholas, you can see the XIRR of 3.84% in the corresponding box above. the calculation is at it is, as i showed the inflows and outflows. for more information you would need to read up on XIRR and how does that work out. If not, you won’t be able to understand why XIRR is relevant here. 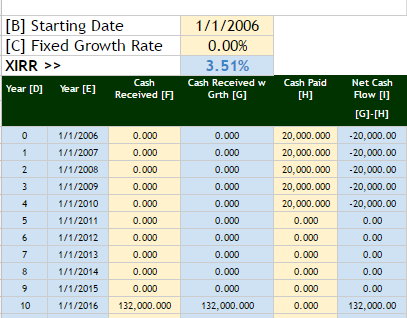 at the various years below, you can see the corresponding inflows and outflows. the figures is what you provided to me. those figures, with the corresponding dates, computes out the XIRR. 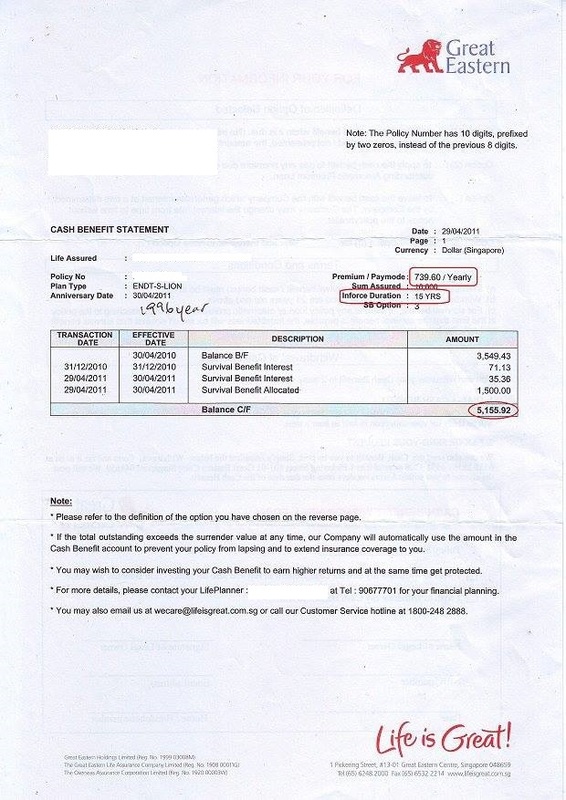 Bought a NTUC Living policy in Aug 1999 and have been paying $5827 every year until now. The surrender value is $122,404. Based on my calculation, the IRR is 3.2%. Wondering if it is acceptable and whether I should continue? 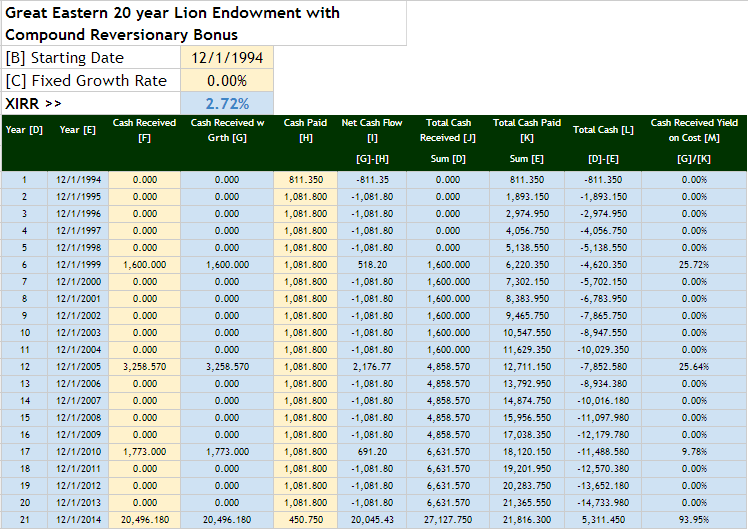 Did a calculation on the 21 and 25 year GE endowment policies that began in 1995. The IRR for the 21 year policy is only 2.4% and 25 year is about 2.3% projected. Hi Tong, that looks good but does that mean the value if you surrender today? sounds to me its near the end of the policy. perhaps you have info on what is the projected realized value at the end of the term. you may want to let me know how long is the policy. Yes, the endowments are maturing soon. But the living policy continues for a very very long time. Hi, I have got this AIA 21 year Special MAE as well. I got it from my dad and am pretty confused. Premium paid: It says Total First Monthly Premium is $80.34(PREMIUMS ARE PAYABLE ON THE POLICY DATE AND EVERY ONE MONTH THEREAFTER DURING THE LIFETIME OF THE INSURED AS PROVIDED ABOVE), doesn’t that mean it’s $964.08 yearly for 21 years, so total is $20245.68? I’m confused over the maturity amount because if its so little compared to the premiums paid of $20245.68. Or am I wrong? Please advise! Thank you so much. Sorry, the duration is just 21 years! 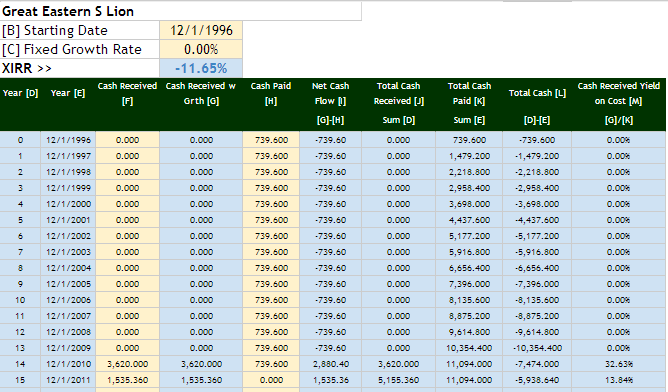 Based on what my dad said, I think he did not leave the cash payments with AIA to earn 6.25% pa, therefore it’s lesser. 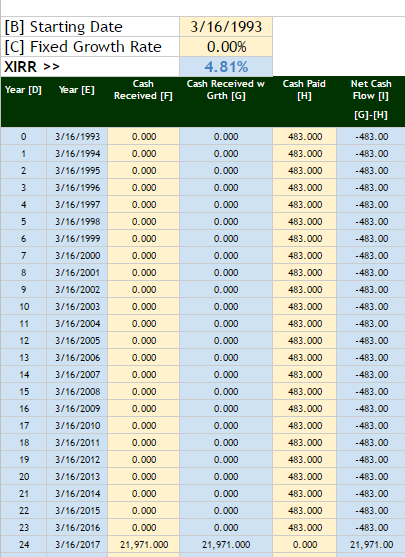 At maturity, you will receive $27888, or when you leave the 6 cash payment(every 3 years) with AIA to receive $34691. I think I will just wait for the overall summary on maturity date. Haha, was really confused! hi An, thanks for bringing my attention to this. there seem to be some missing stuff here. if there is 6 cash payment that your dad didn’t leave it with AIA then we have to know how much is each of those amount. the amount of 12 to 13k provided looks too little. usually these particpating funds there wont be losses, so there might be some missing amount somewhere. is there some info such as what is the surrender value if you surrender now? Name is Ken actually, and I guess I’ll have to wait for the cheque and final summary from AIA next month when it matures. I’m really learning a lot from your writing, just curious to learn how did you get such in-depth knowledge? Through self-study? I am also self-studying about all things finance now, and already have a polytechnic dip, but will be great to spend my time to obtain a part-time diploma from a private school that can add value to my resume as well. The only thing is the cost in getting that paper. I need advice on this! Not sure your age but i am 35 already. All these are self study no course. A lot of bumps along the way. When it comes to knowledge acquisition is how much you want to make it a SYSTEM. that means consistently be a sponge and reading. Rusmin from Fifth Person tells me before all this he was a crazy reader. In fact all bloggers read quite a fair bit. In order for us to prospect stocks, we also have to read a lot. Failure to develop this habit/system/process will be a problem. Is the advance diploma for career? I am sorry i am not familiar with that field. I do know many went the SIM route and did fine. My brother is one of them. If money is an issue, find a place to work full time for lower pay but related industry so that you act as an intern before the uni and build up before you get into tertiary education. Be good at your work and be a sponge. don’t always try to leave at 6pm. Dear Kyith, if its not too much trouble, could you please share the link to the google sheet on which you did the calculation? I’m not sure how to use the formulas for XIRR. The google sheets template will really help. many thanks. I downloaded this link that you shared but I’m unsure how to use it. Will I be able to use it with just raw data without the dates? 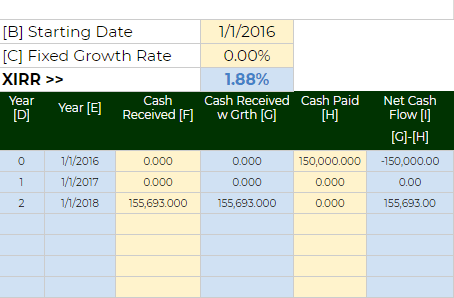 Trying to see if I can calculate the returns based on a projection an agent gave me. Hi Kelvin Wang, I beg to differ. They are apples versus oranges. When you purchase an endowment you are delegating much of the investment a way from yourself, reducing the effort that you need to put in. Stocks are volatile and to invest to have good results that are sustainable, you need adequate competency, and more effort. It is not always only about returns. The policies also protect against a permanent impairment of your capital. Hi Kyith, thanks for taking the effort to do this.. would like to clarify, the ‘duration’ that everyone has been reporting to you is the duration of premium payment or duration to maturity? This is because there are plans out there that require premium payment for let’s say 10 years but maturity some years later… Because it was not clearly defined during data collection, could this have led to overestimation of premium paid? As in, you assume it to be duration of premium payment but what they reported was duration to maturity..
Hi Orangecakes, what i am referring to when it comes to duration is when the policy mature. 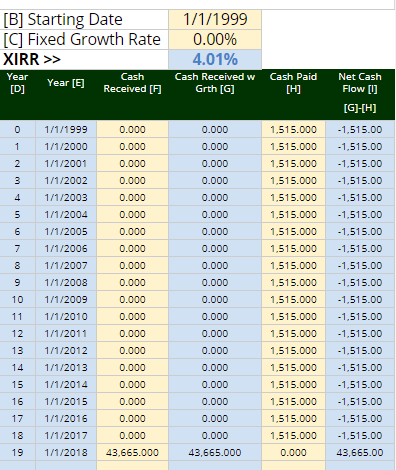 So if you only pay once and the maturity is 15 years later, the IRR is computed at the end of 15 years. hope this clarifies. Seems like many here do not know the calculation of the Revisionary Bonuses (annual bonuses added to your policy) and the Terminal Bonus (last bonus received when you surrender, claim upon or matured). These 2 types of bonus varies between companies. Some companies have lesser RB but more TB while other have more RB and lesser TB. Hi Sup, thanks for explaining. Can I ask a question? Would a policy holder be able to know whether the policy he/she bought will have high RB or TB? OR is it stated in the policy document? This isn’t often talked about but if it is mandatory in the document, then perhaps we omit to factor in. These policies furnish have matured. The problem the policy holder faced is that sometimes the terminal bonus or revisionary bonus is reduced. My brother bought this endowment policy under the CPFIS scheme in 1996 and was expecting at least 2.5% pa after 25 years. Kindly check the details below and advise us whether this is a reasonable return. 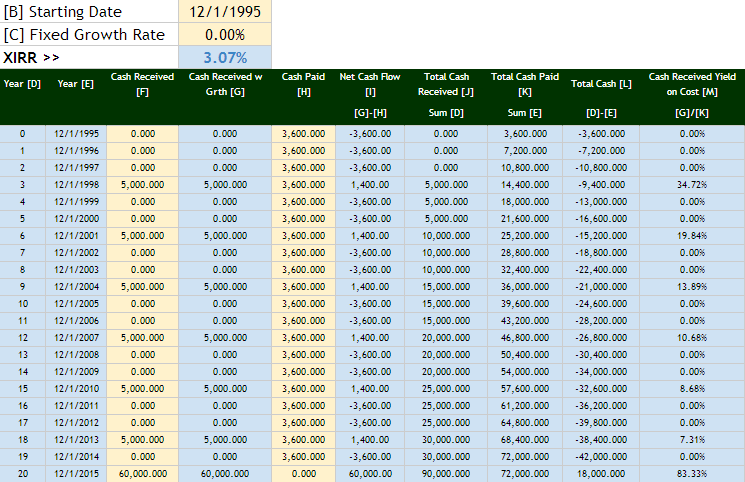 In 1996, the guaranteed portion was $50,000 and non-guaranteed portion was $73,100. Giving a total of $123,100. Btw could you help me find out the name of the plan? Hey Catherine, I think the policy still have 2 years to run, so there might be some more value left. Perhaps the value that you get right now is the surrender value that you ask. In any case, the projection might be slightly different after the next 2 years. Cheers. Would greatly appreciate if you can help me with the calculation so that I can decide to purchase the endowment or not. Cash coupons at $5,000 yearly and $25,000 last year but provided not cash out to get above non guaranteed amount. Hi Atom Ant, I will not be able to add to my crowd sourced results because yours have not matured yet. This is more of an evaluation of how much it yields based on projection. Most of the time it will below projection. 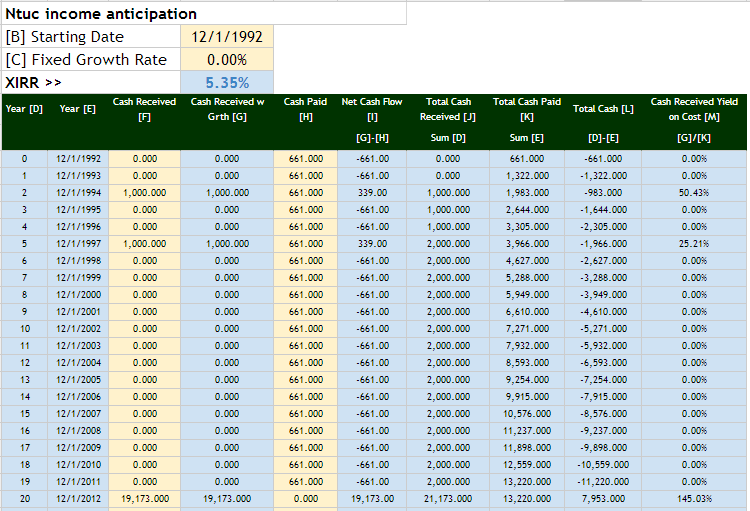 Why not look through my list to give you a sensing of roughly how the returns would look like. When does the 5000/yr cash inflow happen. is it from 2nd year onwards? is it for every year? HI Jasmine, thanks for the contribution. The XIRR is as you have said which is 2.62%. Was it up to expectation? I threw the policy already so I can’t recall the projected return but I’m sure it won’t be so low. Well, I bought this policy when I knew nothing about investment, i was just thinking to save some money for future use, no clear goal or purpose at that moment. This return to me is not too bad but i learned one thing from this policy is: Never trust insurance company projected return numbers! How is your wealth building like right now? I am damn impress that you compute the XIRR! I’m happy to contribute my policy to you and your reader so that they know the actual numbers they can get. 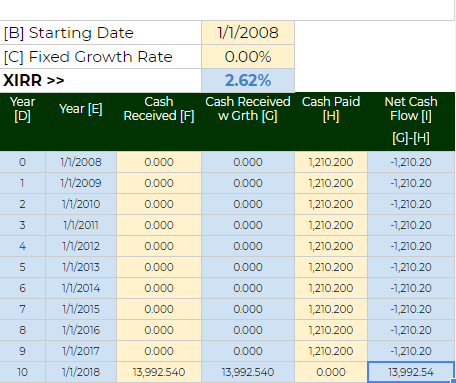 I’m very impressed of one of your article “Your Personal Net Worth Statement – The Complete Guide”, so i start making excel to keep all the records and yes, to keep it updated will make me happy now. I’m enjoying reading your article and thank you for your sharing. Sorry, there’s a typing mistake. Thanks for your contribution! I will add on to the list. Your policy is a short savings deposit and the IRR is what you computed! Let me know if you have more policies! 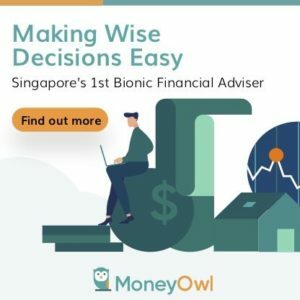 Would like to know if you would wish to do a side-by-side comparison on endowments and CPF interest rates too (assuming putting them together) since many of us are also looking at tax exemptions and CPF rates are also part of the package. (opportunity cost on endowment-cash versus putting into CPF and using CPF loans). Hi Ethan, i am trying to understand. so you are saying the returns of the endowment versus if the CPF grows at 2.5% to 3.5%? i thought the returns will be pretty similar if we divert CPF to purchase this. 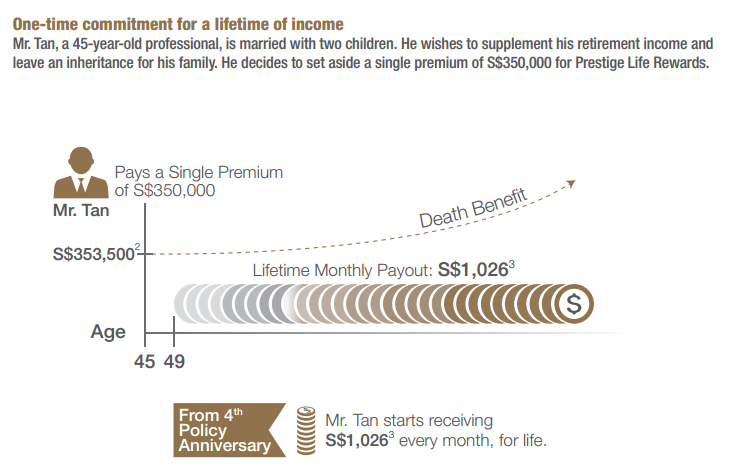 Apparently there are differences in CPF rates from inception till now. So was wondering which would be a better option. That’s an amazing article. Thanks for sourcing and compiling all the data! Wish I came across this earlier. I am in the industry for 16yrs. One of the plans you illustrated is an old bancassurance endowments which everyone in the industry knows will never be good. why? When insurers have to pay hundreds of millions and most recently P insurer paid a whopping billion to be the exclusive insurer for another 15yrs in Uxx bank, you jolly well know how the insurers will need to recoup their billion and who will pay for this cost. I also question the people who buy from the banks. Did they fall for the free vouchers or abalone like now during CNY where banks give you free abalone for new plans signed up? Serve them right, penny smart and pound foolish. Old timers like us all know the best endowments in the past that have matured or are maturing are all manufactured by N and T insurers and annualised return are at an attractive return of 4-5% and usually recommended by a small agency force and a small community of IFAs. Traditionally, the big 3 insurers P, G & A insurers with the largest agency forces do not need to manufacture fantastic products for their customers because they understand that just the exclusive deal in the banks and the sheer size of their agency forces will mean mediocre products will still move and be very sellable. Did anyone even know that N insurer quite recently launched a limited tranche 3yr guaranteed 2.3%/yr compounded return! ?Even better than the SSB that all the financial bloggers advocated albeit with a lock in commitment. 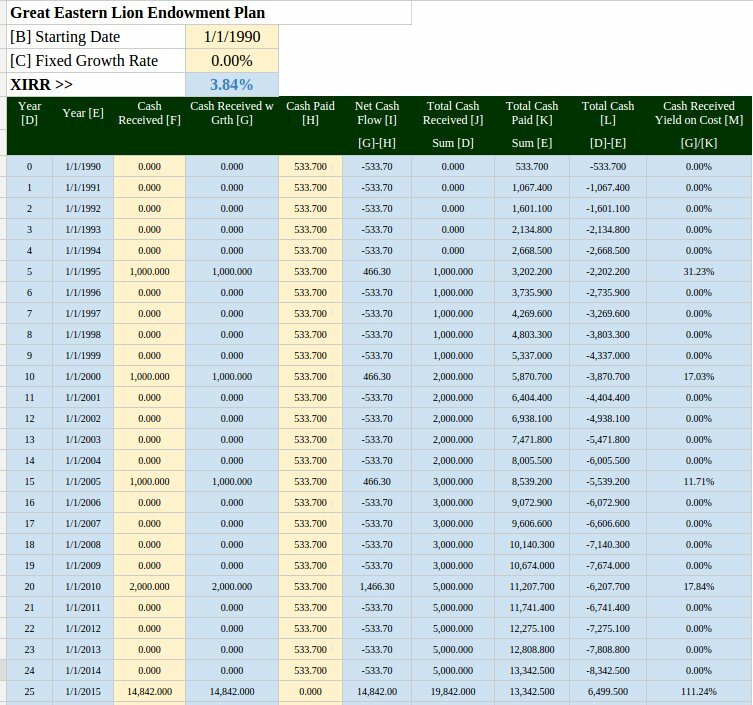 Even the new longer term endowment or retirement plans in the market now have guaranteed yield of more than 2%/yr excluding the NG portion even in today’s climate of lower PIRR as mandated by MAS. You just need to meet the right advisers to recommend you these plans. The truth is there are decent to good products in the market and from insurers but your comparisons is skewed because majority of the consumers are not well served by professional FAs and are buying rubbish plans from traditional channels not known for great products. So when you compare rubbish with rubbish, naturally everything looks like junk to consumers. Instead of brushing everything with a broad stroke, I think consumers seriously should just have more vested interest to do their due diligence. 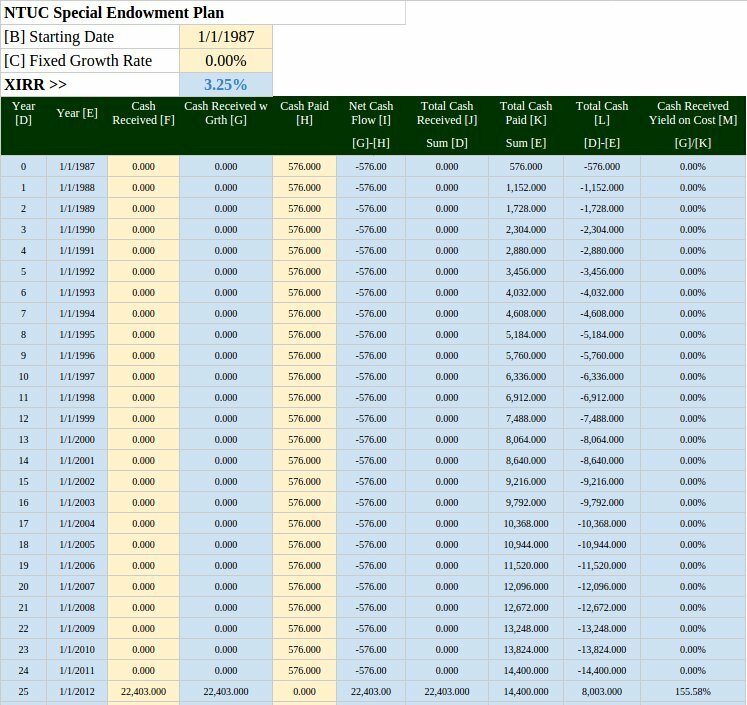 It really make my blood boils whenever I do review and I see a client purchased a savings plan of $20k/yr from the bank where the guaranteed yield is negative at maturity or just equal to total premium paid and they bought in because they were blinded by all the gimmicks thrown in banks like higher FD rates when they buy a plan or some vouchers. Are we able download XIRR template from your website?